This lovely Fresh Start crocheted storage basket is a perfect gift to your friends and family. A simple and easy crochet project, suitable for beginner level crocheters. Once completed, the basket should measure approx. 3 inches in diameter and 7 inches in height. In metric measurements, the finished crocheted storage basket should be about 8 cm across and 18 cm high. 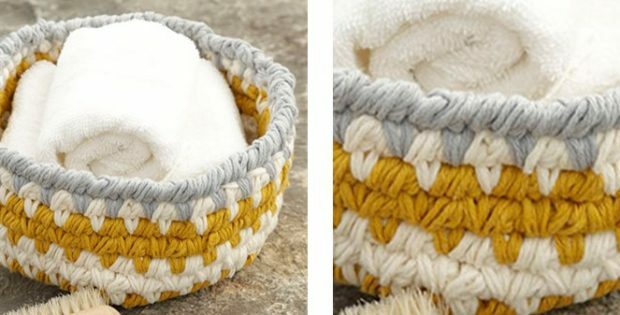 Drops Design’s amazing creative designers are the people responsible for this crocheted storage basket. In fact, you can access the FREE crochet pattern for this lovely storage basket from their website. To access the FREE downloadable crochet pattern for this unique storage basket, please click here: Fresh Start Storage Basket Pattern.